This extract from a recent book on the late Cormac McAnallen recalls the harrowing circumstances in which he was discovered dead. 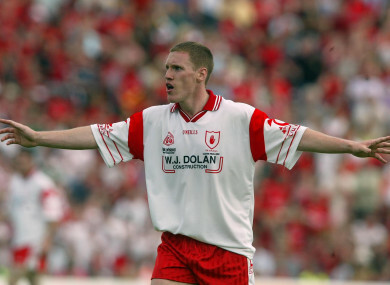 The late Cormac McAnallen helped Tyrone to their first-ever All-Ireland triumph in 2003. THIS IS AN extract from The Pursuit of Perfect – The Life, Death and Legacy of Cormac McAnallen, written by his brother Dónal McAnallen. Cormac McAnallen was the captain of the All Ireland-winning Tyrone football team. He died suddenly of an undetected heart condition in 2004 at the age of 24. This extract describes the harrowing circumstances in which his death was discovered. On the landing I realised that the noise was coming from Cormac’s bedroom. I walked around the corner, entered and flicked on the light. There he lay on his back, tilted slightly to one side, with his duvet half lifted as though he had tried to get up. His eyes were open, staring into space and there was some sort of mucus on his lip. I knew something was seriously wrong. Instinct told me he might have had an epileptic fit, from an undetected problem; I recalled the strange case of a cousin who had a seizure due to the flashing lights of Sonic the Hedgehog years earlier. If not that, could Cormac be choking on his own vomit? Now I realise that the noise was the ‘death rattle’, which I had heard once before, when my grandmother died in a nursing home. At this moment, however, I made no such association. The noise had reduced to an exhaling wheeze by the time I got to Cormac. These were truly the last gasps. I shook him and shouted his name in an attempt to rouse him. I didn’t know what else to do. I knew nothing of CPR. Mummy came in, called his name and looked for a pulse, to no avail. Then she turned him sideways to the recovery position, to see was he choking on something. She hoped she was doing it right, but wasn’t sure. Daddy was awoken by the commotion, and I woke Fergus. 3.15 am: I thundered downstairs to ring 999 from the main landline. Describing what was wrong with Cormac and our exact location wasn’t easy. An ambulance was assigned at 3.17. 3.17 am: Simultaneously, Mummy rang Dr Anjun Ghosh for guidance on artificial respiration. A retired local GP and family friend, he answered from his bed. Immediately he presumed she must be phoning about Daddy. Teresa, Anjun’s wife, awoke. A former general nurse and a trained first-aider, she came on to the line to say she’d come over. ‘I’ll go with you,’ said Anjun, who couldn’t drive since a recent knee operation. After two minutes and 13 seconds, they hung up and got dressed to go. 3.20–3.30 am approx. We tried what we could with our limited knowledge. A few attempted compressions, half-baked breaths of life. But it was futile. He wouldn’t stir. Absolute disbelief consumed us. How could this be happening to Cormac, of all people? Daddy felt cold feet; minutes later, they seemed colder yet. ‘I think the poor child’s dead,’ he declared in a high pitch that I had never heard him reach before. Then he drove out to meet the ambulance, as the 999 operator had requested. Finding a remote house like ours at that dark hour was no small task in the pre-Satnav era. Daddy wanted out of the house anyway, for he could do nothing there to bring his second son back. The Pursuit of Perfection: The Life, Death and Legacy of Cormac McAnallen by Donal McAnallen is published by Penguin Ireland. More info here. Email “'Absolute disbelief consumed us. How could this be happening to Cormac, of all people?'”. Feedback on “'Absolute disbelief consumed us. How could this be happening to Cormac, of all people? '”.